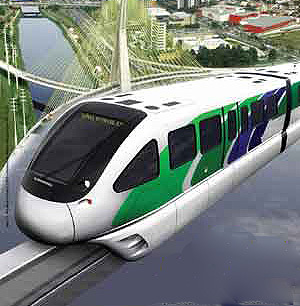 The City of Sao Paulo is currently working on implementing a major monorail network. Three lines are approved so far. Construction began the first line in 2010, before the system supplier had been selected. An astounding 100 kilometers of monorail alignment are proposed. In 2010, Bombardier won the contract for the first 26-kilometer line, Line 15 (formerly Line 2). In June of 2011, Scomi Engineering won the contract for the second monorail, Line 17. In 2014, Scomi also won the Line 18 contract. All of the monorail lines will be integrated with the city's extensive rail system. When completed, the first line will be the largest and highest capacity monorail system in the world, designed to transport 48,000 pphpd, after the predicted fleet expansion. It will reduce end-to-end travel time from current two hours to just 50 minutes with up to 500,000 riders daily. The second monorail, Line 17, is said to be capable of handling up to 252,000 passengers per day. 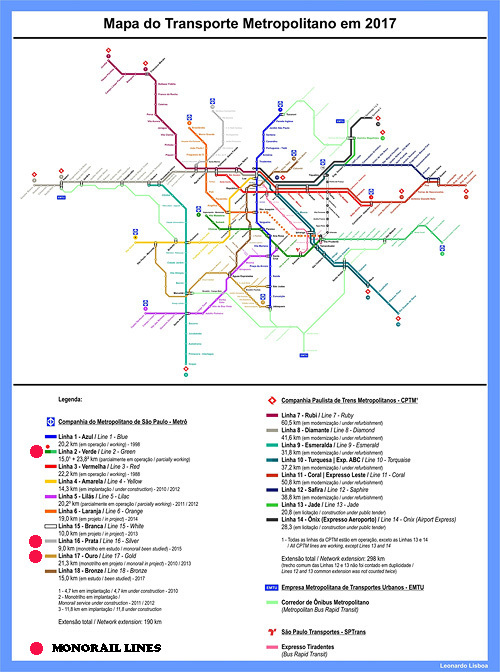 Line 17 would make an arch in the south of Sao Paulo City and connect 4 radials Metro lines, three Bus Corridors and the second most crowded airport in Brazil, the local Congonhas Airport.